Those kids! Pam and I have three older ones, along with their two spouses and two grandchildren. Steve and Patty have three in the mid-range. Kole and Rachel have two that are younger. Through the years we have often taken our family with us as we travel. We believe this is important for them and for the churches and conferences when at all possible to do. FEAR: Remember that the fear of God is the beginning of wisdom (Ps 111: 10). God is not one to be trifled with or treated even with the slightest disrespect. Fear of God is the awareness that God sees and hears everything and can actually do something about it. When a child, even an unconverted child, is keenly aware of God’s ability to see and even know everything in the outward actions and the heart, he or she will be tempered in wrong behavior and attitudes even when parents are not around. That’s the idea. Interestingly, teaching children to obey parents is the starting place for that, and is the principle command for young children. Even in the unbelieving world, an obedient child is a wise child. I realize that this doesn’t mean his actions on their own please God, nor does it mean that he is converted on a scale of good behavior. Yet awareness of God being involved in all of life is a huge deterrent to sin in at least an outward way. Through it doesn’t save, such behavior in a nation is to be preferred over anarchy. This is precisely why we teach our children commands to obey and chastise them in love when they disobey. We hope the severity of the consequences makes a wise child who can be trusted when parents are looking and when they are not. And we pray that such a respect for God authority will eventually point the child in the right direction so that they will follow Christ fully. LOVE: Love for God is another matter. One can fear God as an unbeliever, but will find it impossible to truly love God without God’s work in his or her life. Love is based on a new value of Christ above all other things and persons. It isn’t merely action or emotion, which are fruits, but value. That value is gained when the true glory of Christ is revealed to the child in such a way that the child’s world is turned on its head, and relationship with Christ is the supreme good. Christ words are trusted and his person adored. Like the man who found the treasure the in the field, then sold all he had with joy to buy that field, so the child becomes an entirely new person by treasuring Christ above everything else. He turns from his former way of life to something far better (Read, “What Does It Mean to Love Christ” by Jim Elliff to learn more about love as value). Our CCW team wishes to be good examples in child rearing, but we also make some colossal mistakes from time to time like every parent does. Pray for us that our family life will honor God in every way. I’ve asked each of our team members to share with you just a little about each of their children, in order to know us better. 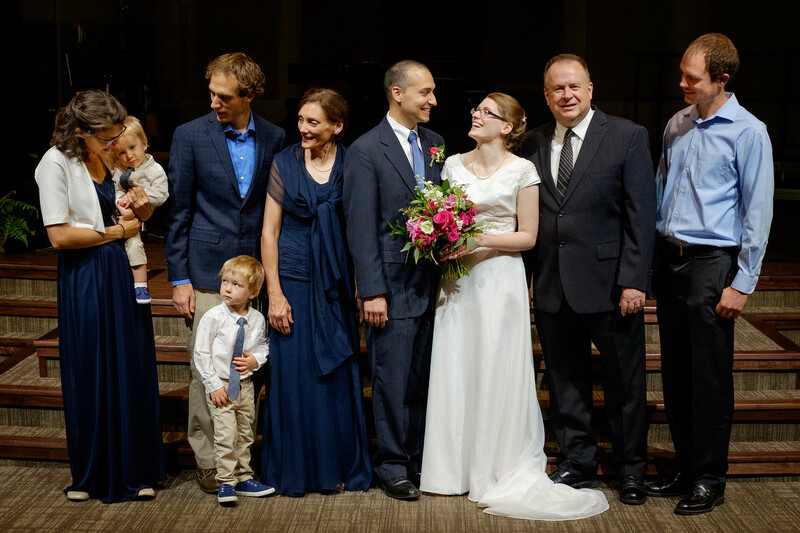 The Elliff family: Pam and I are blessed to have three children. Benjamin lives across the river in Kansas City, KS and works for a Christian team of electricians. Having studied Hebrew and Cognate languages in Israel when he received his Masters, he spends much of his spare time pursuing language and Bible backgrounds. He’s a member of our church but also teaches on Sunday in another church to help them out. Bryan, 29, a former CCW worker, is now in California at UCLA where he will pursue his PhD in OT languages and cultures. He also received his Masters in Israel. 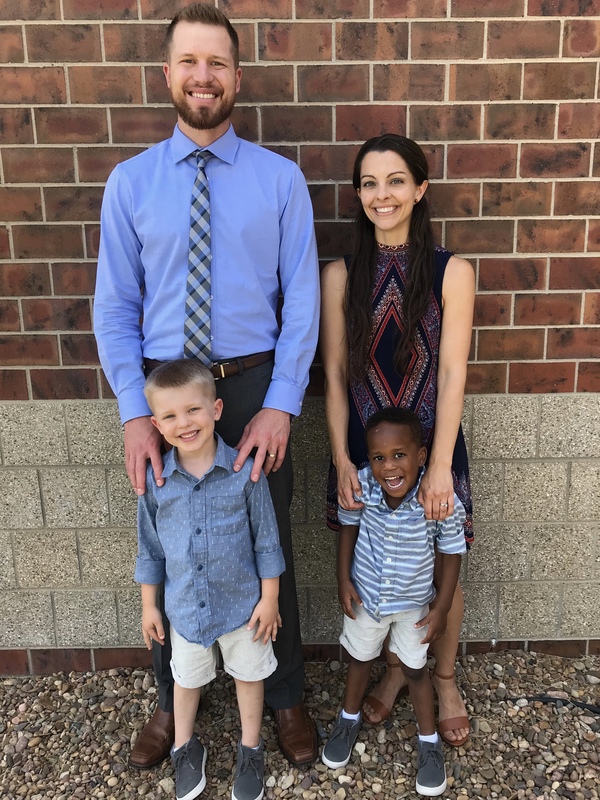 Bryan is married to a wonderful wife named Joey and they have the world’s best grandchildren, Lucas and Zion, ages 3 and 2. Laura, 26, just got married on September 1 here in KC. They are now in Los Angeles working on Passport and visa so that Laura can join her husband, Marco Scouvert, in his ministry in Johannesburg, South Africa. Marco was converted in NY where his family lives, and received his MDiv at The Masters Seminary. Please pray for them. The Burchett family: Patty and I have three children—Katie, Luke, and Lilly. Katie just turned 16 and has begun her sophomore year in school (homeschool). She’s very interested in theater, having participated in multiple productions through a homeschool co-op, plus she’s entering her third year of participation in Greenleaf Performing Arts Academy. She loves her friends in the church. They are a wonderful group of young people who are serious about the Lord. Luke is 13 for a couple more months. This summer, his budding lawn mowing business grew by several clients. He really enjoys outdoor work. He’s also improving daily with his guitar and mandolin. He and his friend, David Wingerd (banjo and guitar player), started a group called “The River Bend Pickers.” They’ve played at a local opry, plus they often play in touristy Weston, Missouri, on Saturdays. In a few weeks, they’ll play an hour set at a farmers’ market about thirty minutes away. Lilly turned 10 in June. We’ll often see her dancing around the house like a ballerina or gymnast. If she could go to the library every day, she would. She loves to read! You might recall that Lilly was born with Williams Syndrome (about 1 in 13,000 births in the US). As I write, we are at the National Institutes of Health where Lilly is participating in research regarding Williams Syndrome. Her siblings are also taking part. 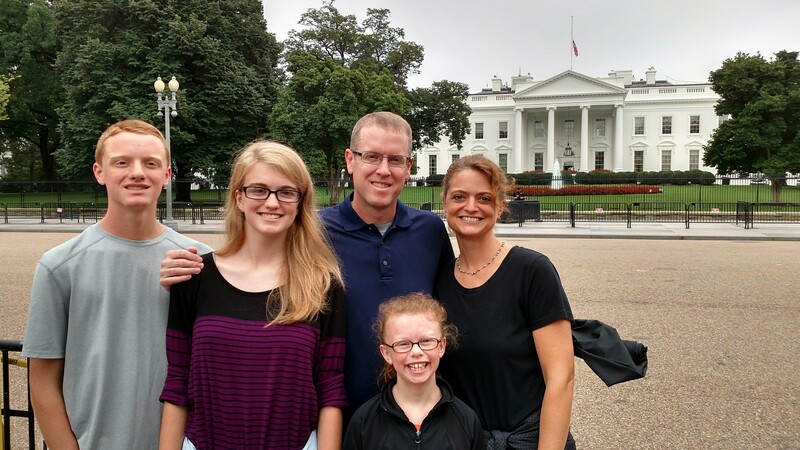 The researchers, plus future families affected by Williams Syndrome, are benefiting by our participation in this, and we are getting to enjoy some time in Washington, D.C. The Farney family: Rachel and I have been blessed with two boys, Karter and Russell. They recently have taken a great interest in playing “trampoline football” which is a mix of jumping, tackling, amateur martial arts, and lots of smiles. We often look at each other and ask, “How is it that God has been so kind to us?” They consistently increase our joy. Karter, 6, is full of curiosity and is a model of persistence in most situations. The Lord has given him a tender and considerate spirit toward others and consistent desire to know more about Jesus. He is working through 1st grade material here at home under Rachel’s care. He loves listening to stories (Narnia and Hank the Cowdog are favorites). He also is a self-appointed sensei for Russell, mostly working on proper kicking form and verbal “Hiya!” during their rigorous living room training sessions. We sincerely hope you will pray for our families. Our newest book, Surplus: Fearless Generosity in 2 Corinthians 8-9, is in the pipeline to publication. It is written and edited and will be formatted very soon. We’ll keep you posted. This book by Bryan Elliff promises to be very helpful to believers, giving insight into the backgrounds of an amazing passage that will stimulate a whole way of life related to the voluntary use of our surplus for the people of God. I’m challenged by it; I know you will be also. It will stand alone as a book, but may also be used with our discussion questions included for small groups and mentoring. Please pray for all the steps to be completed and the book to reach publication soon. And, while you are at it, please continue to pray about our travels for the One we value above all.